In my last blog post, I embedded video from the keynote address that Tamim Ansary gave to the Redwood Writers Conference in October 2009. During the introduction, I mentioned that he also had an historical novel that covered the ill-fated occupation of Afghanistan by British forces in the 19th century. Good historical fiction transports the reader into another place and time and serves to bring the past back "to life." It allows the reader to understand historical events, that often appear larger than life, to be brought down to a human level through the eyes of a character. 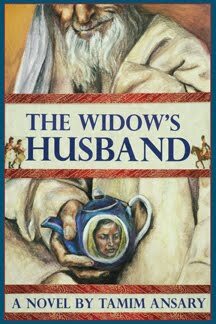 In The Widow's Husband we see life in a small village of Char Bagh in rural Afghanistan in the 19th century. The concerns of family, community, as well as having enough food stores to last through winter is recognizable, even if the names and customs are unusual to our "western" ears. The routine of rural life in Char Bagh is disrupted by the arrival of a stranger. Hospitality is extended to the man and it soon becomes apparent that he is not a normal traveler, but is instead a mystic. This holy man attracts pilgrims from miles around. Soon the reputation of Char Bagh is even noticed by the British military who have settled in Kabul which then threatens the peacefulness and stability of the village. The novel shows how the British colonized Afghanistan: bribery and force. Attempts by the British to interact with the Afghan people without attempting to understand their customs and traditions led to the inevitable clash depicted in the novel when the people revolted in response to the mistreatment of their women and girls. The Widow's Husband serves to illuminate events from history and allow us to draw parallels to current events from our own military campaigns and why it is important to be there with the consent of the people. The novel can be purchased as an ebook from Scribd.com or a trade paperback version is available from the publisher.